As we'll soon have no choice in gear/stat optimization in PvP, I thought it might be fun to go over some of the min/maxing type choices we have now, and why I use what I use. In opposition to PvE standards, what I'm looking for in PvP is not how to get the highest DPS over the course of the fight. Instead, I'm looking for the highest burst potential, both reactive and planned. To be clear, my total for these 20 second segments were within the range of 630k and 726k damage, this one certainly had some good RNG, and I timed my trap fairly well for the 2pc set bonus. Also worth noting, this damage included having versatility enchants (which we'll look at later), but no weapon proc, and no trinket buff (proc or on-use). The first thing I looked at was what the effect would be of lining that up with a Mastery Scope proc, or a MS Scope proc. Because it's hard enough to line up good RNG with my burst when not dealing with any scope/trinket procs, and because I was relying on my friend instead of a training dummy (as a side note, they should really make the PvP training dummies work like hitting a player), I decided to just math the effects of the scope procs. So we actually ended up with the MS scope coming out slightly ahead of the Mastery scope. The reason this happens, is that a Murder of Crows is such a large amount of our burst. So while most of the time, in your normal rotation, you have nearly 80-85% of your damage coming from abilities affected by Mastery, while crows is up is down to 69.5%. While this is surprising enough to be interesting. I do have some caveats. Even though the MS scope came out slightly ahead, it was very, very slightly: .04% more. If we get just one more Explosive Shot during the duration of the scope's proc, the Mastery scope pulls back into the lead, by about .5% more. Also, when the scope procs while Crows is on CD, then we start seeing the Mastery scope pull ahead by more than a percent. There's another significant consideration, because the two are so close, we actually start to see armor making a difference in which one is better. The slight edge that the MS scope has is that it works on all of your abilities. However, the extra abilities that it works on (compared to the Mastery scope) are all physical damage, and do reduced damage based on your opponents armor. I did my testing above against a monk (leather armor); if you switch the armor values for a clothe class, you'll see the value of the MS proc go up (not significantly, but a little bit), while the Mastery scope doesn't change. On the other hand, if you put in the values for a mail or plate class, the value of the MS scope goes down. Of course, we're talking about incredibly small differences here. From playing with my spreadsheet a bit, to me it looks like the Mastery scope is the better choice. This is because with bad RNG, the MS scope is only very, very slightly better, but with good RNG, the Mastery scope can be significantly better than the MS scope. Again, we're not talking about huge differences here, but Versatility enchants do come out slightly ahead, and they have the added benefit of giving you a little over a percent of passive damage reduction. Earlier this morning, I was playing around with creating a BM build based on getting the most focus possible. In most tiers, there are either obvious winners: Chim Shot giving 10 focus; Big Game Hunter increasing the chance to crit, thus increasing your Dire Beasts from Wild Call procs; or Stampede and aMoC simply requiring you to use the least amount of focus. In the level 15 tier, however, we have two talents that can increase our focus. One with the Pack -- The chance for Wild Call to reset the CD of Dire Beast is increased by 10%. Way of the Cobra -- For every pet or guardian you have active, Cobra Shot deals and additional 5% damage. Dire Stable -- Dire Beasts generates 4 extra focus when they attack. Of course, for this little experiment, Way of the Cobra is out, as for the moment, we're only looking for the greatest focus. Unfortunately, for OwtP to be worth while, it would have to double the number of resets you get. Because Dire Stable doubles the focus generation from each DB hit, we need twice as many DBs to make up for it. We simply aren't going to get that when switching from a 30% chance to reset DB on crits, to 40% chance to reset DB on crits. REMOVED: Call of the Wild -- When Wild Call resets the Cooldown of your Dire Beast, the duration of all active Dire Beasts is increased by 8 seconds. REMOVED: Unleash the Hounds -- Dire Beast has a chance to summon an additional beast. REMOVED: Focus of the Titans -- Maximum Focus is increased by 40. 3 levels. Focus of the Titans -- Multishot focus cost is reduced by 15. 3 levels. Basically, it looks like BM is just a very incomplete spec so far (which I suppose is fair, considering it's still not playable on the Legion Alpha). I expect to see some pretty big changes coming for BM, perhaps returning to Cobra Shot generating focus, or greatly increasing the focus regen of Dire Beast attacks. Yesterday, Blizzard announced some more specifics of how PvP will work in Legion. The most shocking, for me at least, was the explanation of how gear will work. In Legion, your gear will not matter when you're PvPing. Your ilvl will have a slight effect on how powerful you are when pvp'ing, determining how many of each stat you have, but at a rate of .1% per ilvl. That is, if you're 10 ilvls higher than someone else, you'll have 1% more stats than they will. The stats that are actually on the gear, however, will not matter in the slightest. And that's the problem I have with this. Everyone who PvPs must now conform to a true cookie cutter build. No switching to a haste build for more pet damage, or a versa build for more survivability; for any spec you play, every other player of the same spec will have the exact same stats, with absolutely no customization. They are making this change in the name of balance, which I have to admit, is a pretty good excuse. There is some sort of integrity in admitting they don't know how to balance PvP. I don't know that just giving up and making all specs conform to one build is the best solution, but, if you're interested in balanced PvP, it does look like Legion has some potential. They still have a long way to go to reach the goal of balanced PvP, though. While having everyone in the exact same gear does lend itself to balancing DPS and HPS, it does little for the other things that actually make a class/spec good for PvP: self heals, CC, other utility, burst, etc. My biggest concern, however, isn't really that everyone will have to play the same cookie-cutter build, and it will get boring. What I'm really worried about is that they'll take this control away from the player, but then won't balance things. Anyhow, perhaps this is the right direction to take PvP. I'm under the impression that Blizzard gets a lot of complaints about PvP, and I may be part of a very small niche group that has enjoyed it for the past couple expansions. I hope I'm wrong, and that this new direction indicates that they're really committed to balance. That may be worth the loss of control in gearing choices. As with all things legion, we'll see. Here's the battle.net blog, for anyone who hasn't seen it. As you can see, people's responses where drastically different if she said "according to sims, X talent does slightly better or slightly worse depending on the situations, than when she said "Top guides all pick Y talent" or "top players all use Y talent". Of course, this isn't a super thorough experiment, but informally, it gives a pretty great insight into the mindset of WoW players. I'm actually a bit surprised that even at the worst, only 51% of people said it isn't acceptable to keep using the talent. Anyhow, the point of the article, I think, was to say we shouldn't discourage customization. Instead of talking about that, however, I want to talk about something that continually bugs me on hunter forums all over the internet. I like to keep an eye on the battle.net hunter forums fairly often, and I occasionally browse the hunter forums at Elitist Jerks and MMO-Champion, I don't post very often, but occasionally I'll see a hunter who has posted his logs, and is looking for help, and I'll jump in with whatever I can discern from the logs. Something that continues to happen is most people will respond with "you should be using [this talent]", or worse "You should be using [trinket/weapon/whatever]". In the case of the latter, perhaps it has happened at some point in time where someone had tons of extra gear they'd just been passing on because they didn't know which to wear. However, in the vast majority of cases, if someone is wearing a bad trinket, it's because it's the only one they have. There are times when I think people should change talents. The thing is, some talents are just easier than others. Let's take the last Hunter Talent tier as an example. 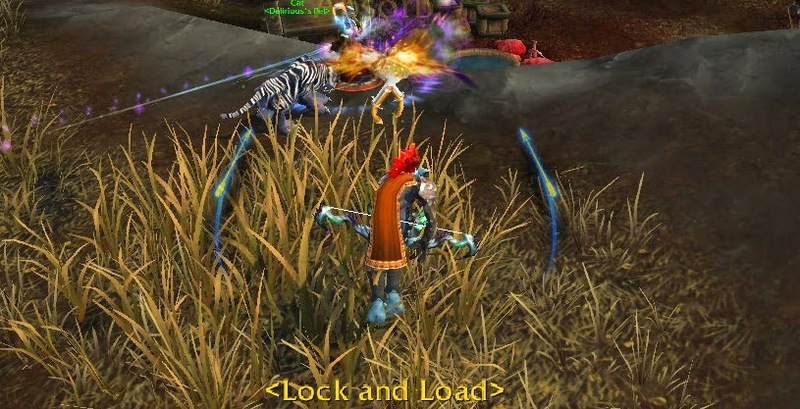 We've got Exotic Munitions, which is almost completely passive; Focusing Shot, which is completely active and includes a movement restriction; and Lone Wolf, which is technically passive, but has a hidden active component, in that you lose your pet damage, which had been passive damage (I wrote about the skill cap of Lone Wolf here, back in the WoD beta), and your damage is now 91.7% based on performing your rotation correctly (the other 8.3% comes from autoshots). You may look at that, see Focusing Shot doing the most dps, and choose that. Focusing Shot, for a patchwerk style fight tends to be easier than Lone Wolf/Exotic Munitions for most players, because you don't have to plan ahead your focus management as much. This, in turn, allows you to fairly easily keep Chim Shot on CD, and does not punish you as much if you spam too many Aimed Shots and run out of focus (as it only takes you about 2.5 seconds to nearly refill your focus bar). However, as movement components are added in to fights, Focusing Shot becomes more and more difficult to use well, as if you're out of focus but can't stand still for a few seconds, your dps goes down to basically 0, until you can stop and build focus again. 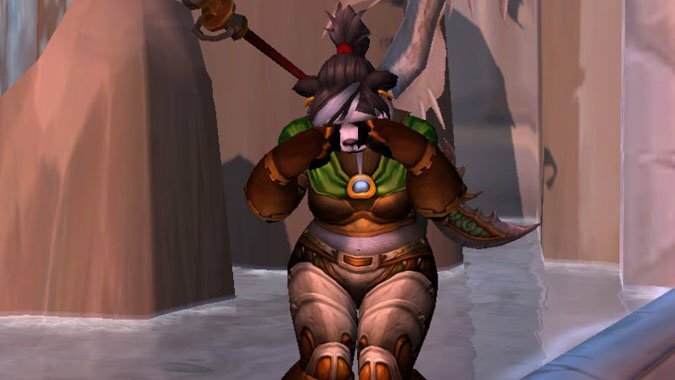 In HFC, often that means Lone Wolf is significantly better, as, for most hunters, managing focus is easier than managing movement (which sometimes isn't even possible, if your raid leader assigns you a lot of special hunter tasks). 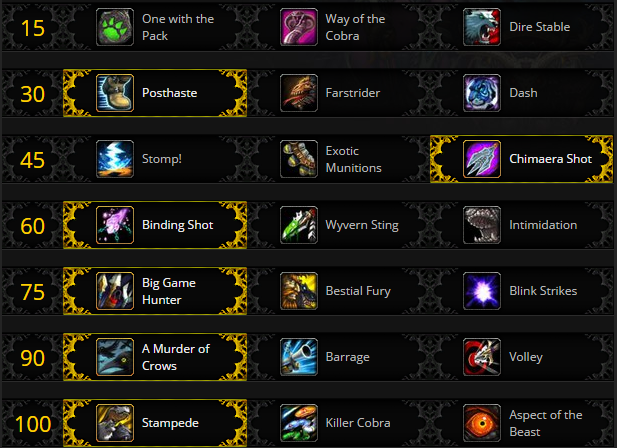 There's one talent I listed above that is sim'ing about 12% worse than the other two talents: Exotic Munitions. EM has been the lowest dps option for that tier all expansion, being relegated to PvP only or hunter jokes. However, there are occasions when it might be the better choice for a hunter. For the sake of this argument, I'll just compare it to Lone Wolf, as that is by far the most recommended talent from this tier. Let's say we have a hunter who is only performing their rotation 50% optimally (if you've been in LFR farming Valor over the last few weeks, you've likely seen there are a lot of players out there who are only doing about 50% of what their dps might sim at). What I mean by 50% optimally is they're casting Chim Shot about half as often as they should be, they have a lot of down time between abilities, they're capping focus at various points, Sniper training has a 40-50% up-time, etc. If they're in the gear I used for the simulations above, with Lone Wolf, they'll still get all the damage from Auto-shot, about 7241 dps, but only 50% of the rest of their dps, 39,998 dps, giving them a total of 47,239 dps. If, on the other hand, they take Exotic Munitions, all they have to do to get the benefit from that is keep their autoshot going, and keep their pet on assist, so they'll passively have 16,702 dps, plus half of the rest of their simmed dps (30,935 dps), giving them a total of 47,637 dps, slightly higher than the Lone Wolf choice. If instead, you gave them help with improving their rotation, their focus management, their movement management, etc., they'll have a much, much greater chance of improving, and likely start seeing higher dps almost immediately. At Blizzcon this year, someone asked me what the hardest problem I'd come across was, math-wise, when theorycrafting. I suppose I'd had a good bit to drink at that point, so I couldn't come up with a good answer, but while working on my BM spreadsheet the other day, and attempting to account for the artifact talents, I thought of an answer. The single hardest problem I've come across (and continue to come across) is how to keep going when I feel overwhelmed. I suppose that's not really a math-specific problem, as I imagine it's an issue with most disciplines, but I feel like it's a really common one in the maths, at any level. What I mean to say is there's no math that I do on this site, or on my own when working on theorycrafting, that is particularly difficult. I don't do anything that your average high-schooler wouldn't learn in algebra class. There are a few statistics short cuts I have memorized for convenience's sake. But aside from root memorization, there's nothing particularly difficult or complicated about the math I'm doing. Where it starts to look complicated is when you combine multiple parts of playing a hunter together. Because there are dozens of equations you need to combine to understand how even a single ability works, it's easy to get overwhelmed and feel like things are a lot more complicated than they really are. The thing is, each one of the dozens of equations, on their own, are very simple: basic algebra and arithmetic. One of the reasons I enjoy abstract theorycrafting is I generally get really excited by numbers. I remember the other day, noticing a fairly mundane fact about focus regeneration during Aimed Shot casts; specifically, that regardless of how much haste you have, you will always generate the same amount of focus during the cast-time of Aimed Shots. This is because for as much as your Aimed Shot's cast time is reduced by your haste, your base focus regen will be increased by haste. This is not important at all, and is just happy little consequence of algebra that I hadn't considered before. When you write out the equations, it seems very obvious, but for some reason it had just never occurred to me, and when I noticed it, it just made me giddy. The point of that story is: I love math, I get excited by the the most basic principles of math. Even so, I still sometimes get frustrated, and get these mental blocks because I'm overwhelmed by the magnitude of processes affecting various abilities. I was working on my legion BM DPS spreadsheet the other day, and as I was nearing completion (or at least had gotten as far as I wanted to with the small amount of information we had at the time), MMO-Champion released their datamining of the new artifact weapon talent trees. Upon realizing how much this changed everything I had just done, I kind of just wanted to give up, thinking "there are too many variables, I'll never be able to do this right, and no one cares about what I'm doing anyway". So, I walked to the liquor store, bought a six pack, and strummed my guitar for a bit. Then I started working on these new Dire Beast changes, and really they weren't that complicated. It didn't take as much thought to set up the new artifact talents as setting up the initial rotation. There was nothing particularly hard about any of the new talents, it was just that when I saw them all at once, I gave up. I didn't take the time to think about whether or not they were actually difficult, I just gave up. One of the reasons I love spreadsheets so much, is I like to imagine my brain having various different cells. Maybe I can't handle thinking about every single thing that's affecting an ability at once, but I can grasp each of them separately, and put that into a cell. Then I can take another cell and put all of them together. Maybe that's not actually at all how my brain works, I don't know. But, if I can understand each of the parts separately, then I have a better shot at understanding how they all work together. If I start by looking at how they all work together without looking at the smaller constituents, then I'm lost. I wanted to talk about all of this, because a lot of people have these sort of panicky moments. Whether your a math-person or not, you can get overwhelmed and not realize how simple something actually is. Or I don't know, maybe it's just me. I'm not trying to tell anyone they have to love numbers the way I do. If you don't like it, that's totally fine too, I'll be happy to do the maths on your behalf! But, if it's just a matter of feeling overwhelmed or panicked, what helps me, at least, is grabbing a beer, maybe listening to some music, and taking it one piece at a time.